Perhaps context is part of the conflict we find ourselves amidst? Context provides meaning. That of when a document was written and the context of the present day. Our nation has seen and participated in much conversation. Conversation of rights, of law, or freedom and oppression. Voices of celebration and voices of concern. This freedom to have a public voice, regardless of position on any particular issue, is cause to celebrate. It has been to long since I took my thinking on any particular political or social issue and framed it in the light of those who preceded us as founders of our fine nation. It was those founders’ actions that allow our discourse to continue unfettered. Please, take a moment and read the courageous declaration they wrote and which we celebrate together, as one people, this weekend. Certainly some high school teacher required I read it, but candidly, I should have and should still read this document of my own volition. It is powerful. Simply as literature it’s worth reading for the beauty and precision of the phrasing. We should all write so well. Serious yes, but also fun. 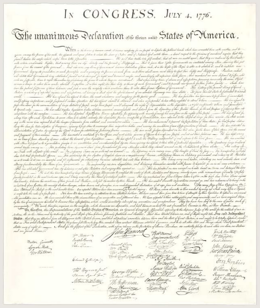 Below the declaration is presented as directly from the transcript maintained by our nations archives. In it you will find humorous spellings, interesting words that are not part of our common vernacular (and a few I had to look up), powerful phrases, accusations, humor. In it they found freedom. Read. Enjoy. Celebrate. Together. One Nation.